Swansea City interim manager Alan Curtis does not expect striker Wilfried Bony to return to the Liberty Stadium during the January transfer window. 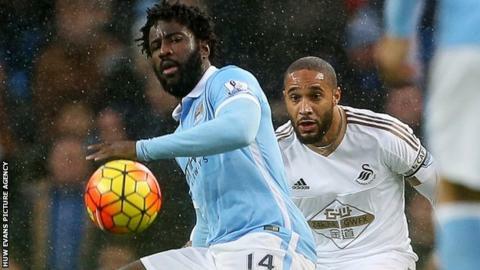 Bony, 27, left Swansea to join Manchester City in January 2015. The Ivory Coast international has been linked with a surprise return to Swansea, who are 17th in the Premier League. "He's playing fairly regularly at City and scoring goals and would be a fantastic addition," Curtis said. "But I'm not holding out any hopes for that one." Curtis, appointed manager until the end of the season, has said a forward is the priority during the transfer window. Bony joined Swansea for £12m from Vitesse Arnhem in 2013 and was the Premier League club's top scorer in 2013-14 with 20 goals. The Ivorian joined Manchester City on a four-and-a-half-year contract in January 2015 in a deal worth £28m. He has scored eight goals in 23 games for City this season while Andre Ayew and Bafetimbi Gomis are Swansea's joint-top scorers with six goals apiece.